Comparison of Wired and Wireless (Bluetooth) Speaker Response – Listen, Inc. This test sequence performs frequency response and distortion measurements of a Bluetooth speaker using both a wireless Bluetooth and wired stimuli, and compares the results. This sequence is configured for use with a Portland Tool & Die BTC-4148 or BQC-4148 Bluetooth interface. Initially, the sequence prompts the operator to turn on the Bluetooth device under test and set it to pairing mode. BTC message steps will connect the Bluetooth device (operator selects the device from a list of detected Bluetooth devices) and connects Bluetooth audio. A 1 kHz test tone is transmitted, and if detected, the test sequence proceeds. A stepped sine sweep from 20 kHz to 100 Hz is played wirelessly to the Bluetooth speaker and measured via a calibrated reference mic. 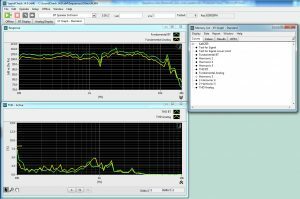 Two post-processing steps convert the sampling rate and alignment of the response, then an analysis step calculates the frequency response and THD. 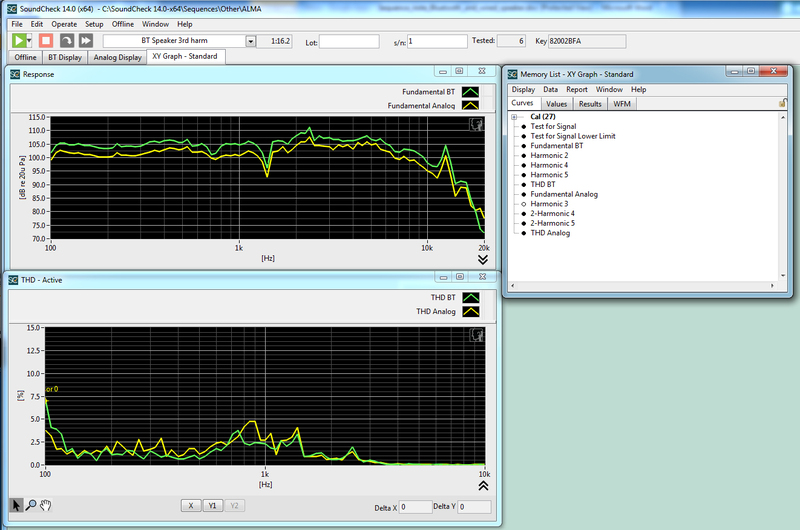 The Bluetooth is disconnected, and the Bluetooth frequency response and THD curves are displayed on graphs. The operator is then prompted to connect the wired analog input into the Bluetooth speaker, and the same measurements are performed using the analog connection. Analog frequency response and THD curves are temporarily displayed on graphs, followed by graphs containing both Bluetooth and analog curves for comparison.